Trimotil Tablet: Each film coated tablet contains Trimebutine Maleate INN 100 mg.
Trimotil (Trimebutine Maleate) is a noncompetitive spasmolytic agent & lower gastrointestinal tract regulator. It possesses moderate opiate receptor affinity and has marked anti-serotonin activity especially on \'mu\' receptors. It induces regulation of spontaneous activity and increases synchronization between electrophysiological spikes and contractions in strips of colon and ileum. However, it does not alter normal motility, but regulates abnormal intestinal activity. • For the treatment and relief of symptoms associated with irritable bowel syndrome. • In postoperative paralytic ileus in order to accelerate the resumption of the intestinal transit following abdominal surgery. For adults: 100-200 mg (1-2 tablets), 3 times per day before meals. Use in children: Trimebutine is not recommended for use in children under 12 years of age. 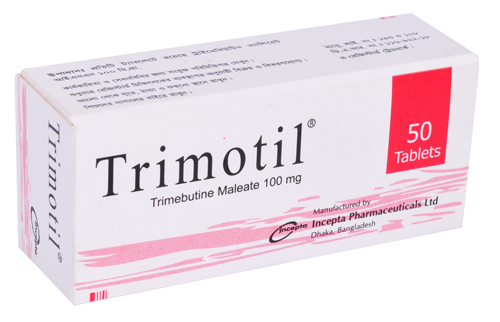 Trimotil (Trimebutine Maleate) is generally well tolerated. The infrequently reported adverse effects are as follows: a) Gastrointestinal: Dry mouth, foul taste, diarrhea, dyspepsia, epigastric pain, nausea, constipation, b) CNS: Drowsiness, fatigue, dizziness, hot/cold sensations, headache etc. Although teratological studies have not shown any drug related adverse effects on the course and outcome of pregnancy, the use of Trimotil in pregnant women is not recommended. It is not known whether Trimotil passes into breast milk or not. This medication should be used while breast feeding only if the potential benefits outweigh risks to the nursing infants.